Welcome to Bearwatch in Gatlinburg! 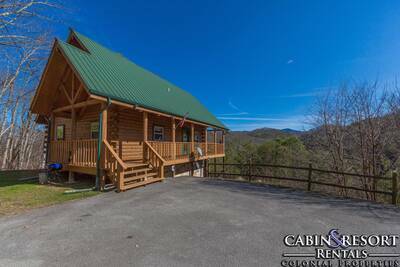 This gorgeous 2 bedroom, 2 bath Smoky Mountain cabin rental is the perfect place to enjoy a peaceful and relaxing vacation getaway. Upon entering this Gatlinburg cabin rental, you are immediately greeted by warm natural wood accents and a wonderful flowing open floor plan. The main living area divides the two bedrooms and features a cozy stone accented fireplace, upscale furnishings, flat screen TV, cathedral ceiling and abundant windows that seemingly bring the outdoors in. Located just off of the living room is the fully equipped kitchen which provides you with all the modern appliances and utensils to treat all of your guests to a delicious home cooked meal while on vacation in the Smoky Mountains. Next to the kitchen is the dining area which can seat up to four people. To the right of the living area is the first of two bedrooms. Here you will find a luxurious queen log bed, in-suite full bath and flat screen TV. To the left of the living room is super amazing log bed king suite. This romantic bedroom features a bedside jetted tub, flat screen TV and access to the attached full bath. If you’re coming to the mountains to have fun with friends and family, then you’re going to love the game room at Bearwatch. Here you’ll enjoy playing each other a game of pool, foosball, relaxing on the sofa or watching your favorite TV programs on the flat screen TV. 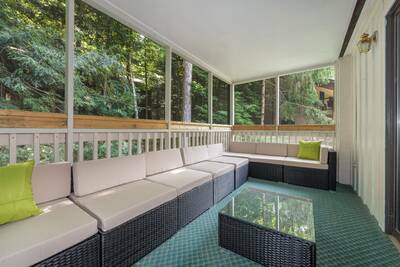 With two covered decks, you’ll definitely want to spend some time outdoors at Bearwatch. The relaxing front covered porch features a cozy porch swing and two person rocking chair. 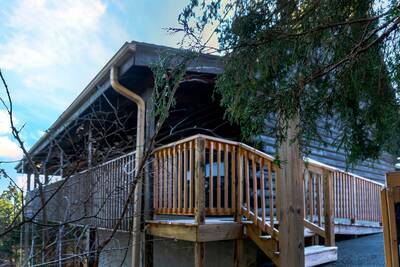 The rear deck area at this beautiful cabin features additional rocking chairs and a bubbling hot tub. Just off of the deck, you’ll also find your very own fire pit - perfect for gathering around with your friends and family, gazing at the stars and keeping warm on those chilly Smoky Mountain nights. If you’re in need of a little R and R and want to experience the beauty of the Great Smoky Mountains and enjoy all there is to see and do in Gatlinburg and Pigeon Forge, then you have to plan your stay at Bearwatch today! “ We had a wonderful time, the cabin is a great place! We were so relaxed we didn’t want to come back home! Thank you for a wonderful time Colonial properties!! “ Great Cabin very clean. We had a great time. “ The cabin was beautiful! Just what our family wanted/needed for our trip. We really enjoyed our stay! “ The cabin is so quaint and lovely. There is a drive up the mountain but after A-day it got a little more comfortable. And the beds were comfortable and clean, the windows were gorgeous, there was a fireplace a TV, and nature elements and a game Room downstairs. I wish I were staying for a week because Gatlinburg was so charming and there's still much to see just outside of Gatlinburg. I would have been content just to sit in my cabin for several days. 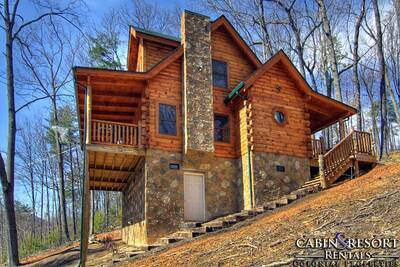 Fewer than 8 miles from the center of Gatlinburg but far enough at the top of the Hill to enjoy nature. I wish I had seen more wildlife but the weather was gorgeous and so was the cabin. 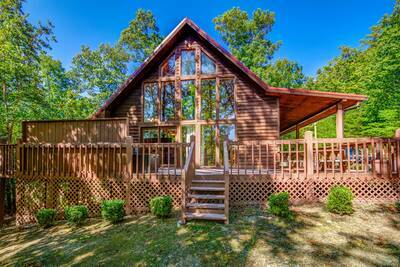 “ The cabin was a great place for my wife and I to spend our honeymoon in. We really enjoyed our stay and our time in the smokies. Would absolutely consider doing it again with your property in the future. “ Colonial Properties was a life saver. First originally rented a cabin from a different company and when we arrived the place was just awful. Very unkept, mold everywhere. Desperate need of maintenance and remodeling. We left that cabin and went to Colonial Properties and they took really good care of us. Josh went out of way to help us find a cabin that will fit our needs. The cabin was great and great location. He and everyone else saved our vacation from being a bad experience. I will definitely use Colonial Properties from now on.